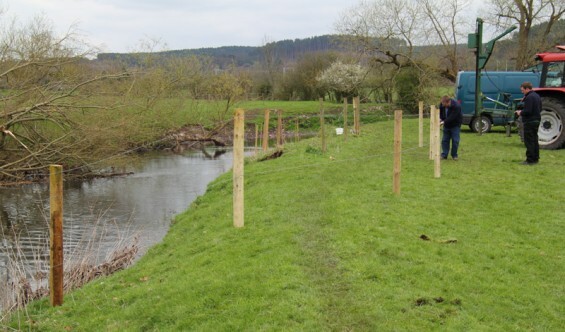 It’s a week on from the destruction of the kingfisher and sand martin nests by the mink. During this time I’ve had several discussions with the landowner and the local Wildlife Trust which has resulted in permission being granted to trap the mink. 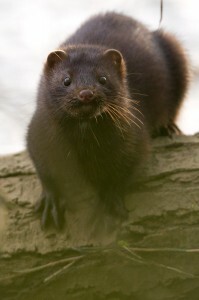 On Friday evening I placed a trap in an area I’d seen the female mink moving through regularly, and on Saturday morning I returned to be met with shrill distress calls emanating from the area around the trap, as I approached the trap there was frantic calling from the undergrowth and I saw three juvenile mink kits being led away from the vicinity of the trap by the adult. Part of the cloth cover I’d put over the trap to create the impression of a cave was chewed and through the hole I could see a juvenile mink inside the trap. Inline with GWCT guidelines on mink trapping, the juvenile was quickly dispatched using an air pistol and I’m now left with the knowledge that the female has at least 3 healthy & mobile juveniles in tow that she will be foraging for. Intervening in an ecosystem is seldom straightforward, and unfortunately there are no easy solutions to problems like the mink. As for the kingfishers, on my last two visits to the site I’ve only seen the adult male on the branch opposite the nest site, where he has perched for a few seconds before resuming his flight upstream. At this point it looks like the kingfishers have abandoned the nest bank, presumably to try and find a safer site elsewhere, there is also no sign of the Sand Martins. As if the flood isn’t enough to deal with, while I was at the kingfisher nest site on Saturday an unwelcome visitor turned up. I’d decided to visit the nest site several times on Saturday to monitor the water level after the flash floods of the last few days. The good news is that the water level is dropping, which is just as well with heavy rain forecast all day Sunday. A couple of hours into my second stint I notice something moving up on the fallen tree that sits opposite the nest burrow. A few seconds later I can see the unmistakable silhouette of a mink, rubbing against the trunk to leave a scent mark on the tree (this is obviously part of what it considers to be its territory). I notice one of the kingfishers is still perched in the tree a bit too close to the mink for my liking. 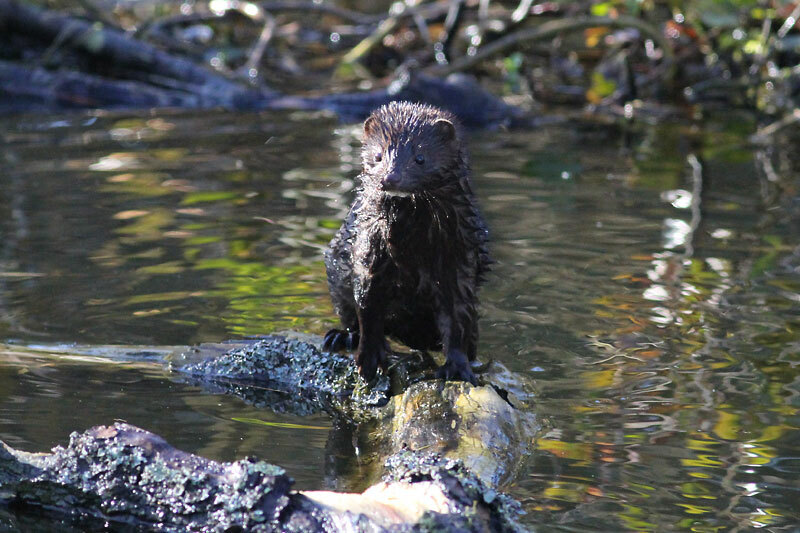 I decide to break cover and see if I can scare the mink off, but to my surprise the mink is completely unconcerned as I approach with the camera. What’s more, the kingfisher (that will usually bolt downstream if it sees me in the open) is about ten feet in front of me watching the mink, but ignoring me. For about 5 minutes I watch the mink as it drops down to the debris washed against the tree by the flood and swims underneath the tree several times before returning up the trunk for more scent marking. 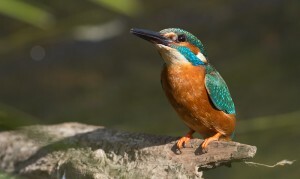 All this time the kingfisher is in attendance watching from above. 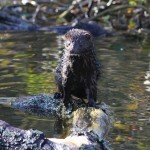 Finally after about 5 minutes the mink drops into the river and disappears. I’m feeling glad that I added additional mesh above the nest burrow last week to prevent anything attempting to dig the nest out, but I’m left pondering whether the mink is stealthy enough the ambush one of the kingfishers. So far though, they’ve obviously coped with the presence of the mink. I can only hope that their instinct for survival is enough to keep them out of its reach. Are you coming out or what? 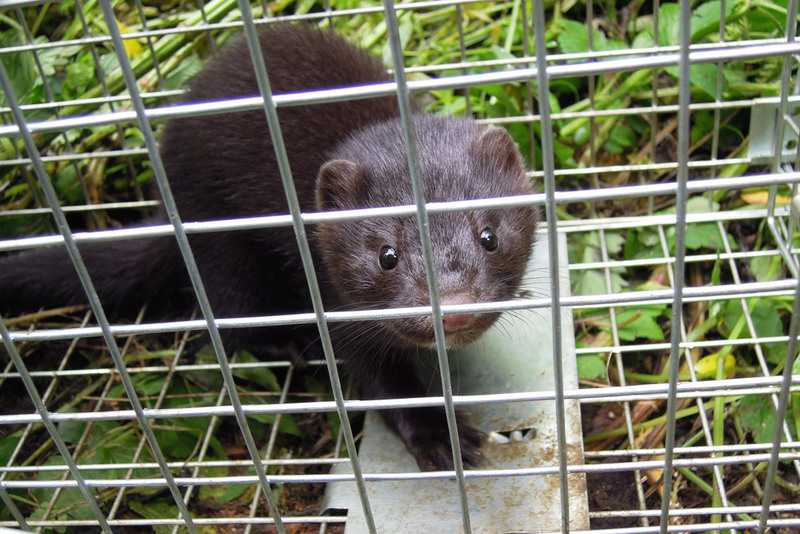 Since my close encounter with the Mink last Friday I have been fortunate enough to enlist the assistance of a local gamekeeper, and so I’ve been visiting the site twice a day to check the live trap we put down under the tree where I saw the Mink. So far it’s been empty each time I’ve visited and I’ll probably give it until the end of next weekend before returning the trap. On the Kingfisher front, I sat in my bag hide today after arriving at about 17:30 to check the trap and watched the nest burrow. After half an hour I heard the familiar high pitched call from downstream and the male bird then flew in to perch in the tree opposite the burrow. he continued to call and after only a few seconds the female exited the burrow and flew across, perching on a branch about 10 feet above the male. She then called a couple of times and then headed off upstream. The male entered the burrow about 30 seconds later and after waiting a minute or two to ensure he was settled, I left my hiding place and headed home for dinner. We should be about half way through the brooding phase if my estimate is correct. 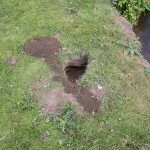 The water level on the river was well up today under the burrow, after some sharp showers yesterday. On a major river like the Trent flood water is a real danger to Kingfishers nest burrows, however, the water level is still a good 4 feet below this burrow entrance, so I think it’s fairly safe from flooding. Kingfisher burrows usually gently slope upwards and end in a small hollowed bowl about 3ft from the entrance. 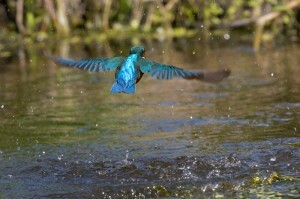 The Kingfisher nest site has been the centre of a lot of drama in the last couple of days. 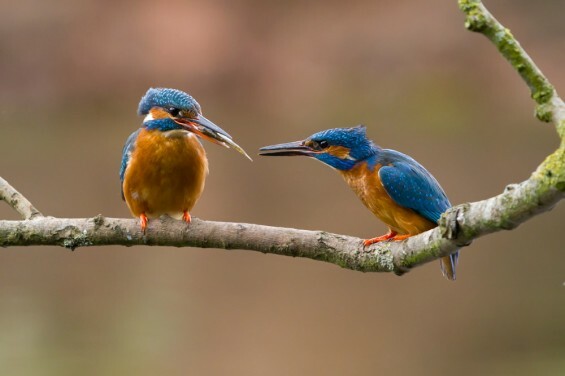 Two serious threats to the Kingfishers have cropped up and although one has now been dealt with, the second is still present and I’m considering what can be done about it. The first problem became obvious when I visited the site to observe the brooding behaviour on Thursday morning. From the opposite bank, I watched in horror as a herd of bullocks shoved there way past and even jumped over the fence protecting the area of the bank with the Kingfisher nest. The fence was put up a few years ago after cattle had stoved in the bank and destroyed a nest in 2004, so to be fair it wasn’t in great repair, however until today I thought it was still servicable. 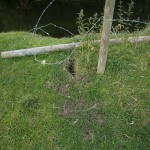 After driving round to the location where I access the bank on the Kingfisher side of the river I managed to lure the cattle away from the bank and then surveyed the damage. 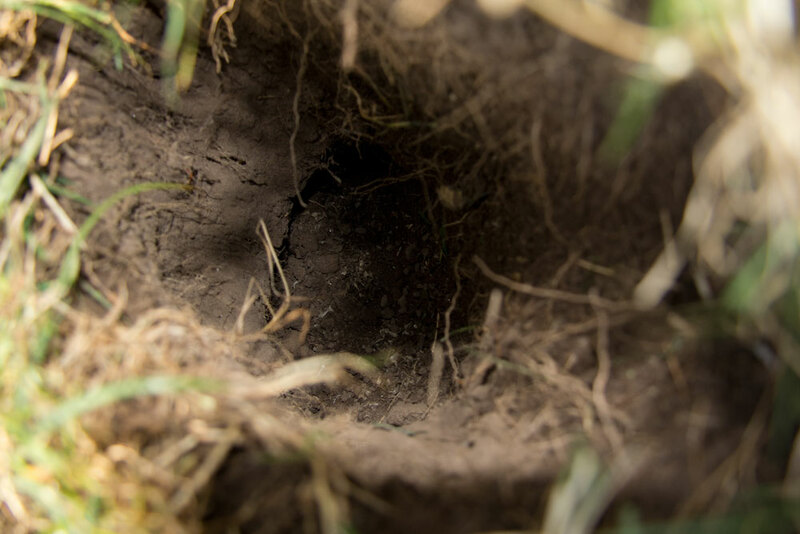 I’d seen the cattle jostling and bucking directly above the nest hole, so I was fairly concerned and on examination a clod of earth was missing directly above the hole. On the plus side, the Kingfishers were still in attendance and I watched in some relief as the male entered the burrow and stayed in for a brooding session. Once I’d established that the nest seemed to be intact I contacted the estate office and despite them being shorthanded over the easter weekend they were great and we managed to organise a fencing repair the same day. If we hadn’t repaired the fence, I feel certain that the bank with the nest in it would have been lost within days. So on Thursday lunchtime we had the tractor down at the site and a new fence was erected. We kept the new fence posts as far from the burrow as we could, but I was very aware every time the posts were bashed in of the potential disturbance to the burrow. So it was with some trepidation that I went down on Friday 6th to monitor the site from a distance using my bag hide. After half an hour I was really pleased to see the male emerge from the burrow and after a brief fishing session opposite the nest return to brooding duty. The male emerged from the nest 3 more times until finally, the female returned and entered the burrow. So, I still have both parents apparently brooding normally despite the disturbance. 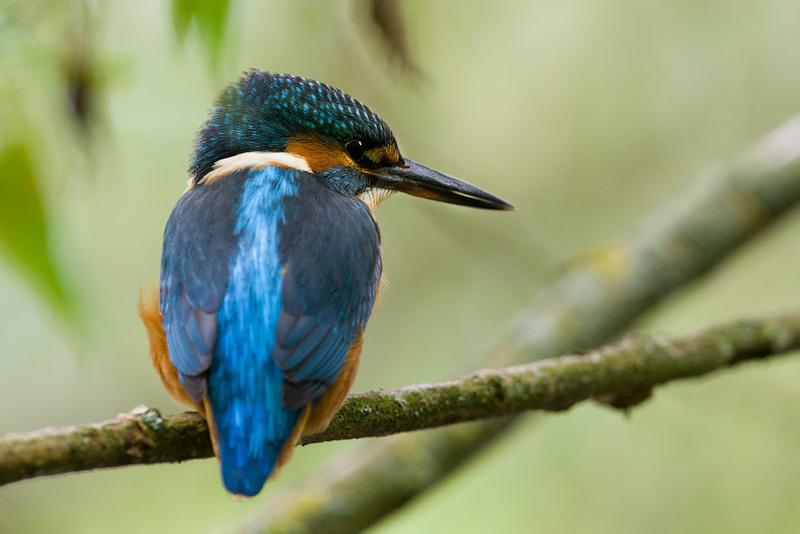 However, the Kingfishers were not all that I saw on Friday. I had been sitting in cover with my bag hide completely covering me for about 2 hours when I heard a noise directly behind me. I slowly turned round and through the small hole in my hide I stared straight into the face of an adult Mink sitting upright sniffing the air and trying to work out what I was. After a few seconds it disapeared for a minute or two and then re-appeared and ran straight in front of me no more than 5 feet from my feet. It hopped over a tree trunk and then to my horror dropped down into the river and swam straight to the undergrowth right next to where the male Kingfisher has been fishing from a low perch in between brooding sessions. 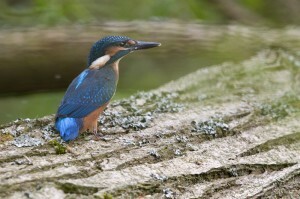 I watched as the Kingfisher emerged from the burrow and perched no more than 6 feet from where I had last seen the Mink. 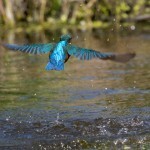 After a few seconds the Kingfisher dove into the water, caught a fish and moved to a safer perch. After the Kingfisher had returned to the burrow I watched the Mink emerge from close to where the Kingfisher had been fishing and trot along a fallen tree branch overhanging the river. Well, that was as much as I saw today. How much time that Mink is spending in the vicinity and whether it could create an opportunity to ambush the Kingfishers I simply don’t know. Either way it re-enforces my intention to protect the burrow from being dug out from above as it was last year, I just hope the adults are going to be OK. As I watched it bought to mind Charlie Hamilton Jones’s film Halcyon River Diary, where a mink ambushed a pair of fighting Kingfishers, so mink are certainly capable of predating adult birds. On the plus side, when I left both adult birds are still present and behaving normally, the bank is now protected from the cattle and so far the Mink obviously hasn’t figured out a way to ambush them. Well I’m feeling pretty gutted right now. The nest site I’ve been monitoring and photographing under license for the last 3 months has been abandoned. For the last 3 weeks I’ve noticed that I was only seeing the male coming in to the burrow with food. No sign of the female. Also, the male was only bringing in fish (although they were pretty large fish) about every 45 minutes, which on reflection I don’t think would be enough to keep a brood of chicks going. The first nest burrow at this site was actually dug out from above, I’m assuming by the mink that I’ve seen regularly along the bank while watching the nest site from my hide. I was really hoping that the second attempt would be successful as another nest site a mile down river had also been dug out from above in exactly the same way. The second burrow was much deeper and there is no sign of any disturbance, so I’m pretty sure that it’s the loss of the female that’s stuffed things up. The male seemed to stop feeding about a week ago and on my last couple of visits I’ve only seen the male flying through the territory. He’s no longer perching outside the nest burrow, which I expect contains the corpses of the chicks. 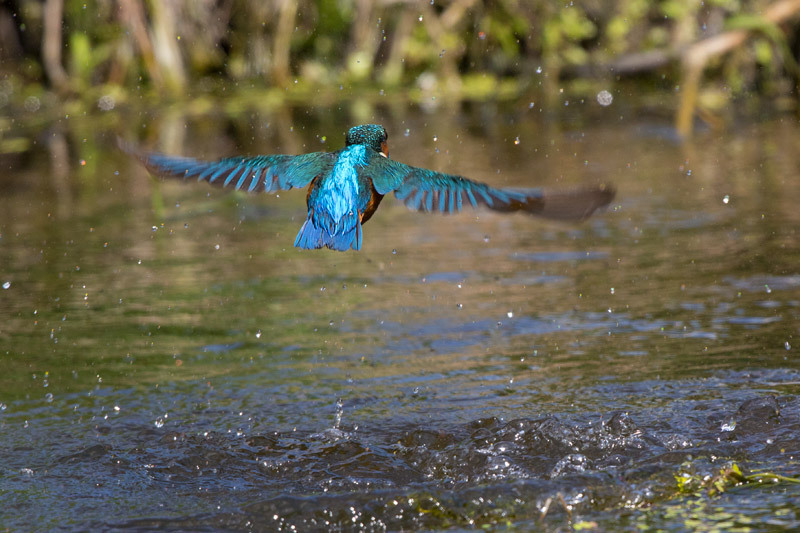 I’ve no way of knowing what happened to the female, but the extent to which Mink are endemic on this stretch of the Trent in Staffordshire is a real worry in relation to the Kingfishers. I’m convinced that the 2 nest sites were dug out by Mink as they were both only about 12 inches or so deep and the holes were dug straight down to nests containing chicks, as evidenced by the fish scale debris left in the exposed nest chambers. 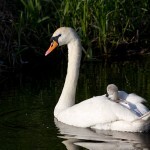 The 2 nests were also destroyed within a few days of each other in late April. 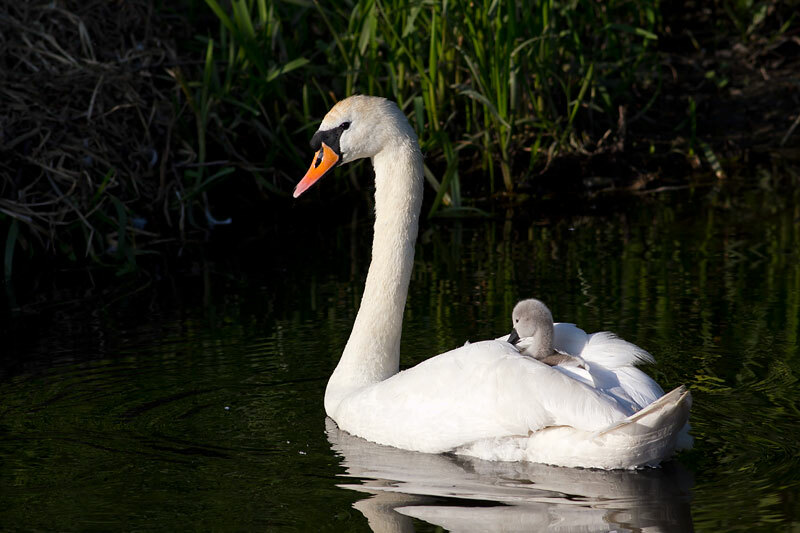 The fact that Swans nesting a hundred yards upstream only have one Signet left is also perhaps indicative of an environment suffering from an invasive predator. 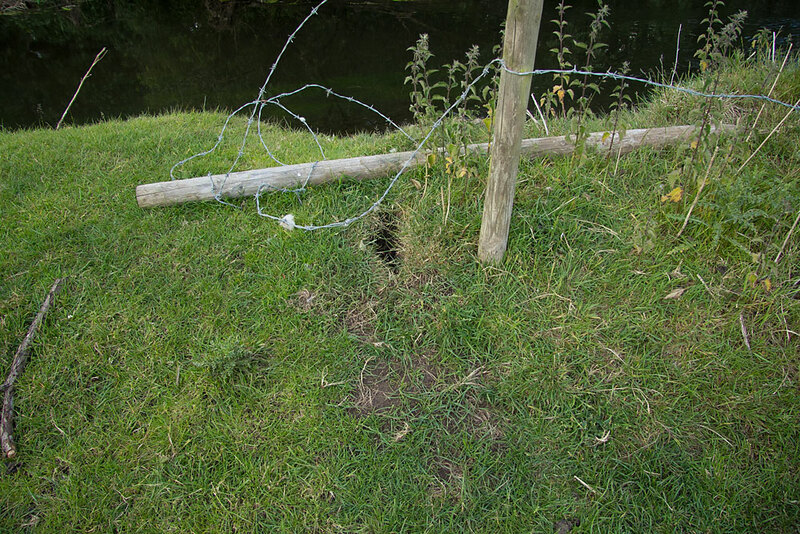 Ironically, this is probably the ongoing fall out from when thousands of Mink were released in North Staffordshire in 1998 by animal rights campaigners. 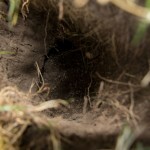 Here are images of the 2 nest burrows after they were dug out. the close up shows the interior with the remainder of fish scales in the nest chamber. 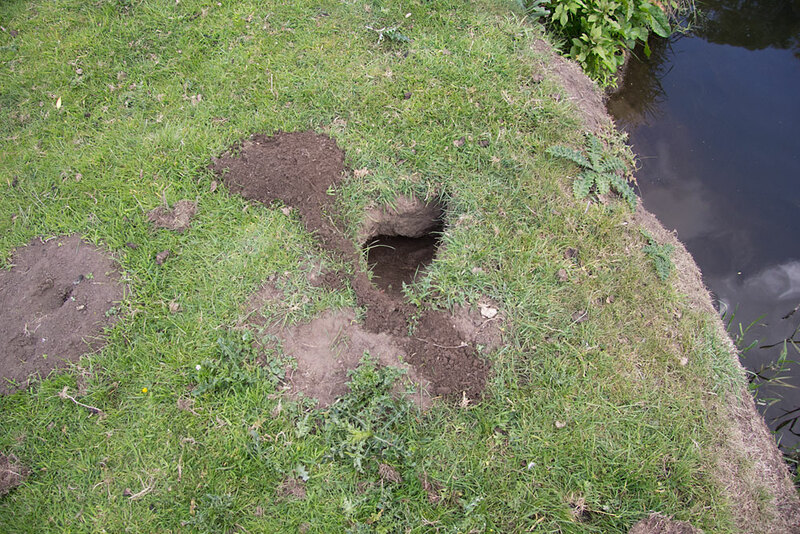 Both of these burrows were dug straight down into, so presumably whatever did this (I’m assuming Mink, was able to hear the chicks).